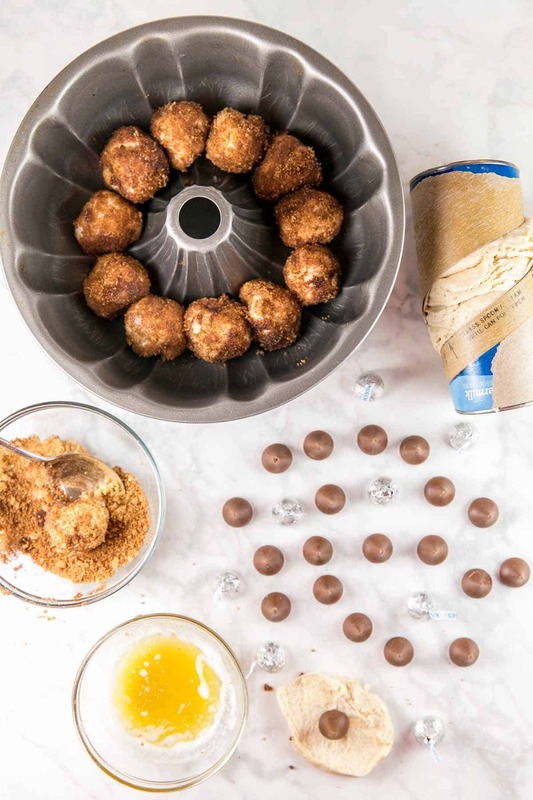 Hershey’s kisses rolled in biscuit dough and covered in cinnamon sugar — whether you call it a chocolate bubble ring or a chocolate-stuffed monkey bread, it’s the ultimate chocolatey dessert for breakfast! 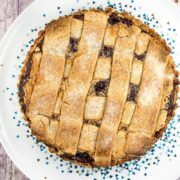 I’ve had a few requests recently for “really easy” dessert-based recipes, mostly for big brunches or parties. And I totally get it — when you’re hosting a giant football gathering or have an entire house of people on Thanksgiving morning before actual Thanksgiving dinner, you need something mostly hands off. It’s not the time to be elbow-deep in flour and sugar. 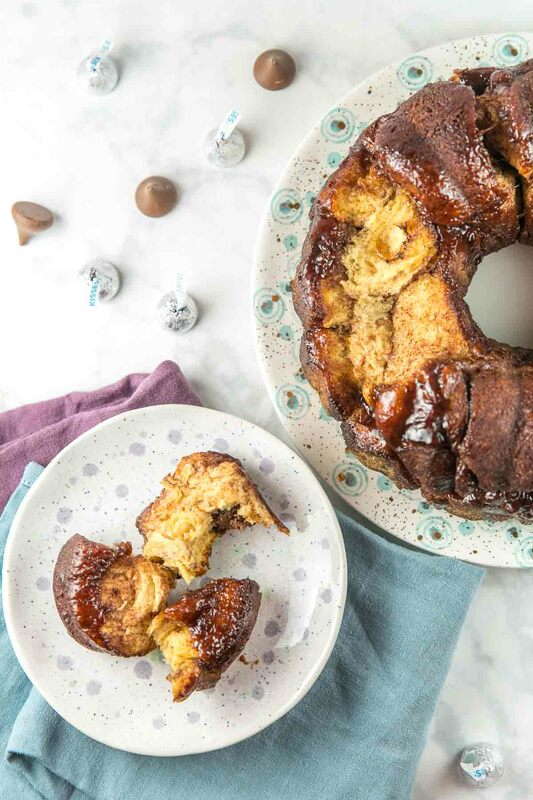 This recipe for a chocolate bubble ring — what could probably also be considered a chocolate stuffed monkey bread — perfectly fits the bill. And as easy as it is, it’s a family recipe, to boot! 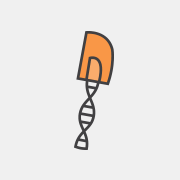 I come from a very small family. I’m an only child, I have zero first cousins, and my lone aunt spent much of my childhood traveling internationally as a ballet dancer. As a result, my parents’ best friends filled in the duty of aunt and uncle. My mother’s Bubble Ring was a standard for visits; whenever they would come to Harrisburg with their two sons, the chocolate bubble ring always made an appearance. I’m not a particularly sentimental or nostalgic person, and yet this chocolate bubble ring brings back so many childhood memories. I’m not a chocolate lover, so this isn’t even one of my favorite things to eat. And yet I can’t help but feel warm and fuzzy inside whenever I think about it. Weekend visits from my honorary aunt and uncle. Hockey games with my honorary cousins. It’s a feel-good food tradition from my childhood. What is a Chocolate Bubble Ring? 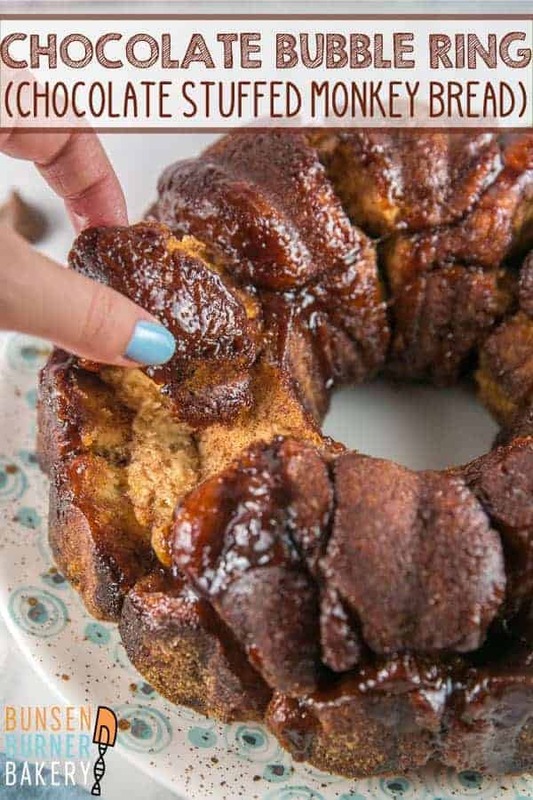 In my family, we’ve always referred to this as a “chocolate bubble ring.” It wasn’t until I reached adulthood that I learned about monkey bread, and realizes this probably (maybe?) 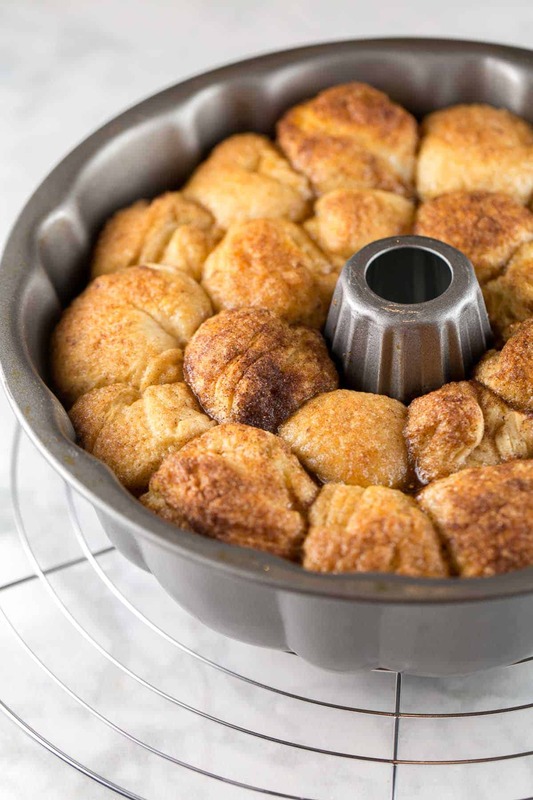 qualifies as a monkey bread. 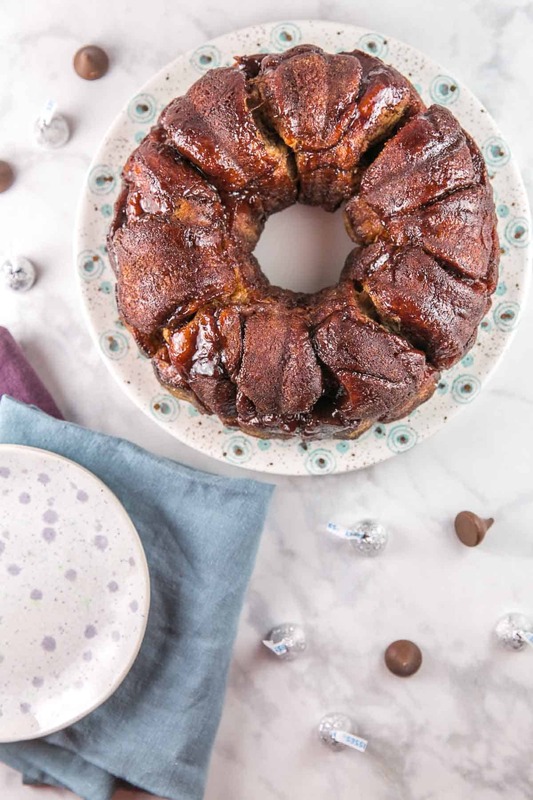 A chocolate-stuffed monkey bread, perhaps? 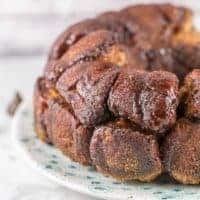 To my knowledge, monkey bread is made by cutting biscuit dough into small bits, tossing with cinnamon sugar, and then pouring melted butter on top. 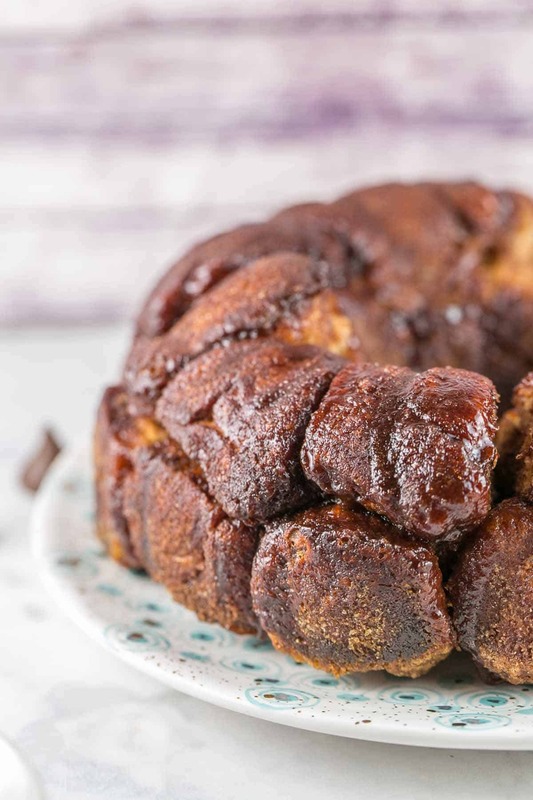 Somehow, I’ve made it through my life thus far without ever actually trying monkey bread, so please correct me if my Wikipedia research on monkey bread is incorrect. A chocolate bubble ring is pretty similar, except you’ll wrap the biscuit dough around a Hershey kiss and roll it into a ball. Dip the ball into the melted butter, and then roll it in a combination of brown sugar and cinnamon. 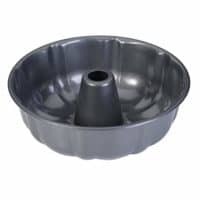 Then bake in a bundt pan. Easy-peasy. 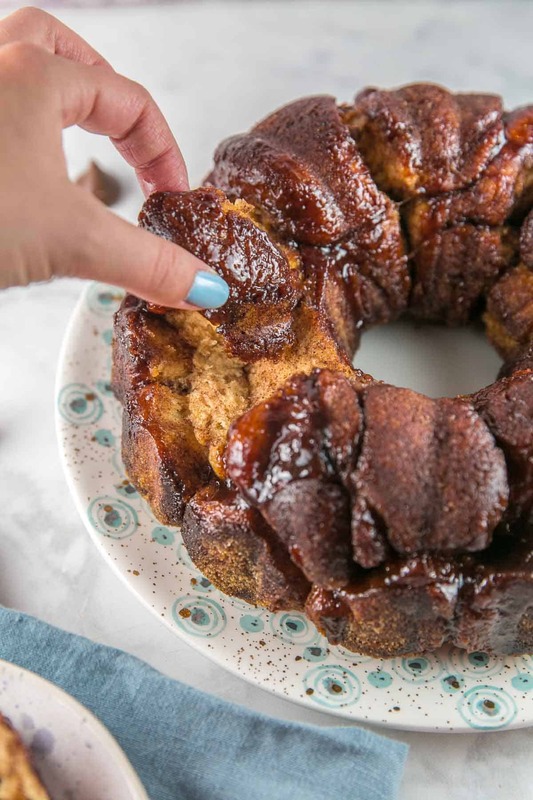 So basically, monkey bread. Except filled with chocolate. I’m going to repeat this one more time. Monkey bread… filled with chocolate. If that’s not a serious upgrade on the original, I just don’t know what is. I like to use “flaky” biscuits (generally the Pilsbury Grands Flaky Layers, but any brand should be the same) because you can divide the biscuit easily. Rather than cut the biscuit in half and then flatten it into a circle, just separate the biscuit vertically into two pieces. You can use plain old granulated sugar to make a bubble ring, but I highly recommend using brown sugar instead. The outside gets really gooey and almost caramelized when it bakes up against the hot edge of the bundt pan. Combined with the cinnamon, it’s irresistible! Don’t let the bubble ring cool in the pan. That gooey, delicious sugar coating will stick to the bundt pan once it cools! Once your bubble ring is done, remove it from the oven, let it sit on the counter for 5 minutes, and then invert onto a wire rack to cool for an additional 10 minutes before digging in. Because of the chocolate, you’ll want to eat this while it’s still warm and the Hershey’s kiss is still soft and melty. If you can’t eat your bubble ring all at once (and if you can’t, what’s wrong with you?! ), pop what’s left back into the oven for 5-10 minutes to warm. But let’s be real: there won’t be any leftovers. Hershey’s kisses, surrounded by biscuit dough and rolled in cinnamon sugar. 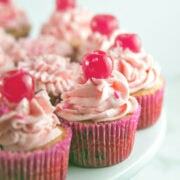 It’s the ultimate decadent dessert for breakfast! Preheat oven to 375 °F. Grease a bundt pan well. Split an uncooked biscuit in half and use fingers to mold into a 3” circle. Place a Hershey's kiss in the middle of of the biscuit and wrap the dough fully around the kiss. Roll into a ball with hands. Repeat for all Hershey kisses and all biscuits. Dip the biscuit ball into the melted butter, then roll in a bowl with the cinnamon and sugar. Arrange biscuits around the bundt pan, building in concentric circles and filling the pan. Bake for 20-25 minutes until golden brown. Leave in pan for a few minutes (no more than 5), then invert over a plate to unmold and allow to cool for 10 minutes before enjoying. Chocolate Bubble Ring is best enjoyed straight out of the oven. If you have leftovers, reheat at 350 °F for 5-10 minutes, until warmed through.